"A time comes when silence is a betrayal." ~ Martin Luther King, Jr.
Soledad O'Brien and Hill Harper were emcees at the 50th anniversary celebration of the March on Washington, "Let Freedom Ring." O'Brien is now special correspondent for Al Jazeera’s America Tonight. Harper played a good cop on the long-running CSI New York and is now a not so nice guy on the USA series Covert Affairs. The following selected remarks from speakers follow and cover the spectrum of issues that we face and can directly impact by taking action. Benjamin Todd Jealous, NAACP President: “The dreamer was also a doer. Let us not just walk away from here today.… When they say, 'No You Can’t pass a real racial profiling ban with teeth,' we say 'Yes We Can!' Because yes we did, two days ago in New York City." Eliza Byard, Executive Director, Gay, Lesbian & Straight Education Network (GLSEN): “Fifty years ago, Bayard Rustin stood on this stage…. A movement spoke through him, but the world would not embrace him because he was gay. Today, LGBT voices are welcomed to this stage. And President Obama has awarded Bayard Rustin the Presidential Medal of Freedom. But we have not yet seen Dr. King's 'great vaults of opportunity' thrown open to everyone. We have so far to go before a truly great education is offered to every child." Bill Russell, eleven-time NBA champion and five-time Most Valuable Player: “Fifty years ago, I met Martin Luther King, Jr. and he asked me to speak. I respectfully declined. I sat in the first row. It’s nice to be anywhere 50 years later.... What I want to tell you now and implore you is to keep up the fight... we can never accept the word status quo has been taken out of our vocabulary.... Progress can only be measured by how far we have to go." Reverend Al Sharpton: "We come here today as the children of Martin Luther King who faced Jim Crow to face the Children of Jim Crow." Randi Weingarten, American Federation of Teachers: "Because the Supreme Court turned their backs on voters, the struggle is for public education, re-claiming the promise of public education so that we can keep the dream alive." Julian Bond, Distinguished Visiting Professor at American University in Washington, D.C and a leader of the American Civil Rights Movement: "We are still being tested by the evisceration of the Voting Rights Act and Stop and Frisk…." Forest Whitaker: "We must embrace this moment together as good will ambassadors and remember that Martin Luther King said, 'I’ve decided to stick with love. Hate is too great a burden.'" Oprah Winfrey: "How will the dream live on in us? Not everybody can be famous but everyone can be great ‘cause greatness shines through service." U.S. Congressman John Lewis, Georgia: “It’s been a long time coming. We’ve come a long way in these fifty years but there is a long way to go. To those who say nothing has changed, I say take a walk in my shoes." President Jimmy Carter: "The crucial question of our time is, how do we overcome oppression and violence without resorting to either?" President Bill Clinton: "He asked the victims of violence to meet that violence, not with violence, but with an open hand." Martin L. King III: He reminded us that MLK said sometimes we must take positions that are not comfortable or politic, but we must take them anyway. Rev. Dr. Bernice King, MLK's daughter and CEO of The King Center for Non-Violent Social Change: "Fifty years later we are standing in the shadow of that liberator (the Lincoln Memorial)… we are still chained by economic disparities and social unrest and now we must break the cycle. In 1967 my Father asked, 'Which way do we go, community or chaos?' We must see the dawning of a new day." 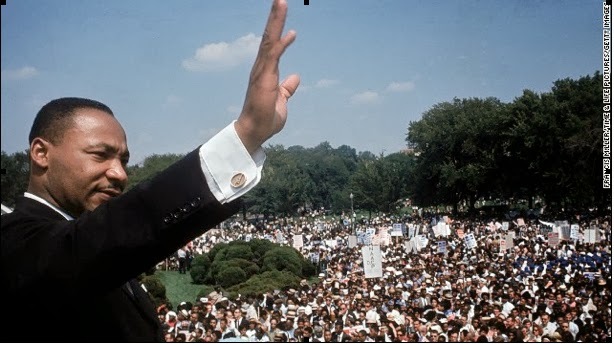 President Barack Obama: "We rightly and best remember Dr. King's soaring oratory that day, how he gave mighty voice to the quiet hopes of millions; how he offered a salvation path for oppressed and oppressors alike. His words belong to the ages, possessing a power and prophecy unmatched in our time." Notice which of these profound statements moved you most. If you are an activist, take stock of the level of your participation and check to see if you are satisfied with that participation or not. If you are already an activist and want to add to your involvement, or if you are new to activism, is there a cause above where you can serve? Each aspect mentioned can use your help. How can the quality of your life be enriched by the model and memory and mission of Martin Luther King, Jr.?